← What About Belly Fat – Central Obesity? I live in a highrise building so I have plenty of neighbors that I see in the halls, on the elevators, walking outside, etc. Several of my neighbors have noticed my MBT shoes and wanted to talk about them, sharing their experiences. As I have suffered from bad feet and, worse, hard to fit feet, all my life, I was pleased to share my positive experience with the MBTs with them. I have high weak arches so my feet always hurt. Arch supports didn’t help much. One lady friend told me how much she loved the MBT sandals. She said that she had never worn anything so comfortable in her life. I told her that I had never been able to wear sandals because of my bad feet. She suggested I try the MBTs. I did. 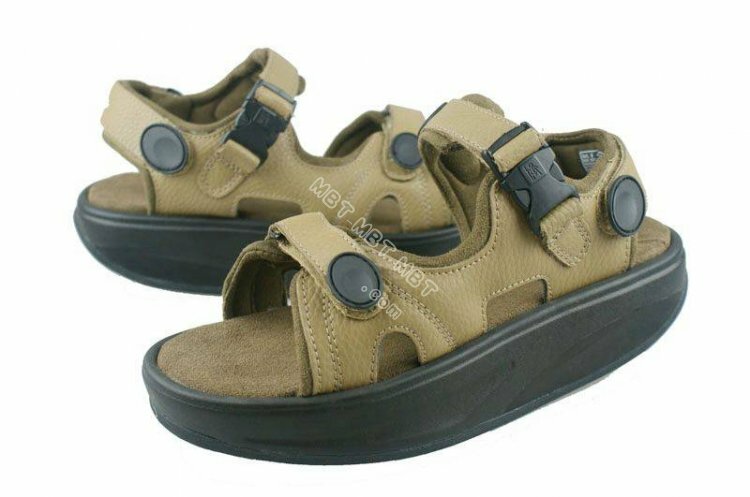 I ordered a pair of men’s MBT Kisumu sandals. What a wonderful surprise they turned out to be. They were everything my neighbor had told me about wearing them and more. I couldn’t believe how comfortable yet supportive they were. I really felt like my feet had morphed into a cat’s padded paws. Hence the Carl Sandburg allusion earlier. The fact that they take my body weight off my arch and move it back to my heel makes walking a joy rather than a chore. As you can see from the illustration, they have very thick soles, yet they are light on your feet. I tested them for driving, too. First rate. This was also a pleasant surprise as I have a MINI Cooper with a stick shift, so I use my feet constantly shifting gears and braking. Last but not least I tried them on my bike. Again, first rate! I now ride daily wearing my sandals. We are having a tropical summer here in Chicago and it is a true blessing not to have to pull up sweat sox on my feet to ride. If you are interested in learning more about them check out the MBT website for full details on the health benefits for your legs, too. They were marked down to less than $100 from the original price of $208 when I wrote about them originally last August. Thank you for posting this great article on MBTs! We hope you are having a happy & healthy 2012. Thanks for the nice note. I just came upstairs from the Health Club where I was wearing my MBT sandals to work out. We’re jealous (behind the computer)! Did you get a good sweat going? I did work up a sweat. One of the things I love about my Kisumu’s is that my feet work exactly as surely as if I were wearing the best gym shoes. They are so much more secure than any sandals I have ever worn. I use them on the treadmill, airdyne bike and the rower. After more than seven years, I have just bought a new pair of MBT sandals.I stand by everything I wrote positively about them previously. If you have high arches and have suffered with arch supports, you should try MBTs.